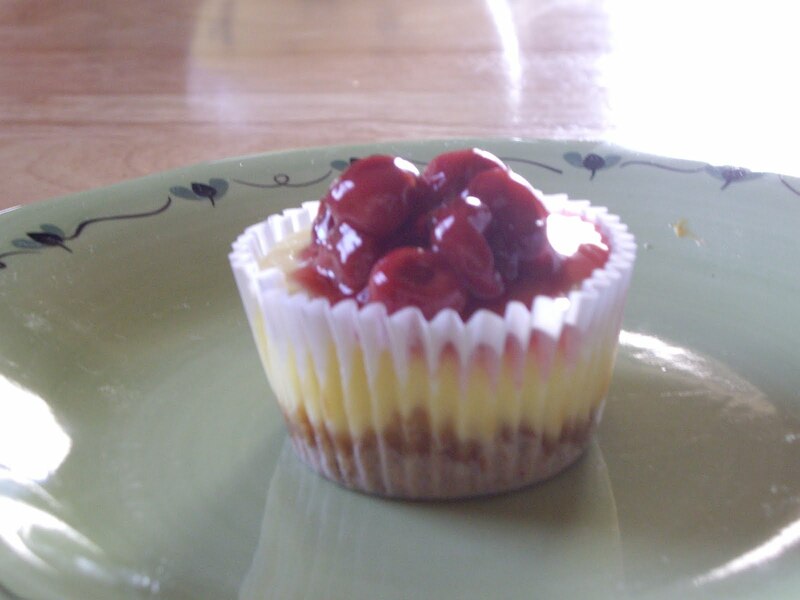 Mini cheesecakes are cupcake size cheesecakes. They are simple to make and very convenient to pack in a lunch for work or school. So, if you love cheesecake here is a simple and yummy way to enjoy it. You will need muffin pans lined with 12 cupcake liners. In a small bowl mix the graham cracker crumbs and the sugar. Add the melted butter and blend with a fork until crumbly. Divide the mixture among the twelve muffin cups. Press down to make a crust. With a mixer, beat the cream cheese until fluffy. Add the sugar, eggs, and lemon juice. Beat that until everything is smooth and no lumps of cream cheese remain. You may need to scrape the sides of the bowl down a few times. Divide the batter evenly amongst the 12 muffin cups. Let the cheesecakes stay in the pan just to firm up a bit so it is easier to take out. When cool enough, carefully remove. After the cheesecakes are completely cool, spoon a couple tablespoons fruit filling over the top of each mini cheesecake. For long time storage, keep in the fridge.